Recorded/performed at: Eugene Goossens Hall, ABC Ultimo Centre, Sydney, on Jun 14. Peter Sculthorpe Tamara Anna Cislowska 1 mins, 32 sec. Recorded/performed at: Eugene Goossens Hall, ABC Ultimo Centre, Sydney, on Jun 14. Peter Sculthorpe Tamara Anna Cislowska 4 mins, 8 sec. Recorded/performed at: Eugene Goossens Hall, ABC Ultimo Centre, Sydney, on Jun 14. Peter Sculthorpe Tamara Anna Cislowska 5 mins, 5 sec. Recorded/performed at: Eugene Goossens Hall, ABC Ultimo Centre, Sydney, on Jun 14. Peter Sculthorpe Tamara Anna Cislowska 1 mins, 12 sec. Recorded/performed at: Eugene Goossens Hall, ABC Ultimo Centre, Sydney, on Jun 14. Peter Sculthorpe Tamara Anna Cislowska 2 mins, 27 sec. Recorded/performed at: Eugene Goossens Hall, ABC Ultimo Centre, Sydney, on Jun 14. Peter Sculthorpe Tamara Anna Cislowska 49 sec. Recorded/performed at: Eugene Goossens Hall, ABC Ultimo Centre, Sydney, on Jun 14. Peter Sculthorpe Tamara Anna Cislowska 47 sec. Recorded/performed at: Eugene Goossens Hall, ABC Ultimo Centre, Sydney, on Jun 14. Peter Sculthorpe Tamara Anna Cislowska 6 mins, 51 sec. Recorded/performed at: Eugene Goossens Hall, ABC Ultimo Centre, Sydney, on Jun 14. Peter Sculthorpe Tamara Anna Cislowska 12 mins, 52 sec. Recorded/performed at: Eugene Goossens Hall, ABC Ultimo Centre, Sydney, on Jun 14. Peter Sculthorpe Tamara Anna Cislowska 8 mins, 26 sec. Recorded/performed at: Eugene Goossens Hall, ABC Ultimo Centre, Sydney, on Jun 14. Peter Sculthorpe Tamara Anna Cislowska 1 mins, 44 sec. Recorded/performed at: Eugene Goossens Hall, ABC Ultimo Centre, Sydney, on Jun 14. Peter Sculthorpe Tamara Anna Cislowska 6 mins, 11 sec. Recorded/performed at: Eugene Goossens Hall, ABC Ultimo Centre, Sydney, on Jun 14. Peter Sculthorpe Tamara Anna Cislowska 2 mins, 55 sec. Recorded/performed at: Eugene Goossens Hall, ABC Ultimo Centre, Sydney, on Jun 14. Peter Sculthorpe Tamara Anna Cislowska 5 mins, 4 sec. Recorded/performed at: Eugene Goossens Hall, ABC Ultimo Centre, Sydney, on Jun 14. Peter Sculthorpe Tamara Anna Cislowska 7 mins, 27 sec. Recorded/performed at: Eugene Goossens Hall, ABC Ultimo Centre, Sydney, on Jun 14. Peter Sculthorpe Tamara Anna Cislowska 7 mins, 11 sec. Recorded/performed at: Eugene Goossens Hall, ABC Ultimo Centre, Sydney, on Jun 14. Peter Sculthorpe Tamara Anna Cislowska 3 mins, 21 sec. Recorded/performed at: Eugene Goossens Hall, ABC Ultimo Centre, Sydney, on Jun 14. Peter Sculthorpe Tamara Anna Cislowska 2 mins, 40 sec. Recorded/performed at: Eugene Goossens Hall, ABC Ultimo Centre, Sydney, on Jun 14. Peter Sculthorpe Tamara Anna Cislowska 1 mins, 49 sec. Recorded/performed at: Eugene Goossens Hall, ABC Ultimo Centre, Sydney, on Jun 14. Peter Sculthorpe Tamara Anna Cislowska 2 mins, 30 sec. Recorded/performed at: Eugene Goossens Hall, ABC Ultimo Centre, Sydney, on Jun 14. Peter Sculthorpe Tamara Anna Cislowska 25 mins, 20 sec. Recorded/performed at: Eugene Goossens Hall, ABC Ultimo Centre, Sydney, on Jun 14. Peter Sculthorpe and William Stanley Tamara Anna Cislowska 5 mins, 16 sec. Recorded/performed at: Eugene Goossens Hall, ABC Ultimo Centre, Sydney, on Jun 14. Peter Sculthorpe Tamara Anna Cislowska 1 mins, 54 sec. Recorded/performed at: Eugene Goossens Hall, ABC Ultimo Centre, Sydney, on Jun 14. Peter Sculthorpe Tamara Anna Cislowska 1 mins, 7 sec. Recorded/performed at: Eugene Goossens Hall, ABC Ultimo Centre, Sydney, on Jun 14. Peter Sculthorpe Tamara Anna Cislowska 56 sec. Recorded/performed at: Eugene Goossens Hall, ABC Ultimo Centre, Sydney, on Jun 14. Peter Sculthorpe Tamara Anna Cislowska 2 mins, 18 sec. Recorded/performed at: Eugene Goossens Hall, ABC Ultimo Centre, Sydney, on Jun 14. Peter Sculthorpe Tamara Anna Cislowska 11 mins, 30 sec. Recorded/performed at: Eugene Goossens Hall, ABC Ultimo Centre, Sydney, on Jun 14. Peter Sculthorpe Tamara Anna Cislowska 1 mins, 48 sec. Recorded/performed at: Eugene Goossens Hall, ABC Ultimo Centre, Sydney, on Jun 14. Peter Sculthorpe Tamara Anna Cislowska 8 mins, 40 sec. Recorded/performed at: Eugene Goossens Hall, ABC Ultimo Centre, Sydney, on Jun 14. Peter Sculthorpe Tamara Anna Cislowska 2 mins, 17 sec. Recorded/performed at: Eugene Goossens Hall, ABC Ultimo Centre, Sydney, on Jun 14. Peter Sculthorpe Tamara Anna Cislowska 1 mins, 27 sec. ABC Classics is delighted to unveil a deeply important new recording: the complete solo piano music of Australia's most revered composer, Peter Sculthorpe, who died in August 2014. 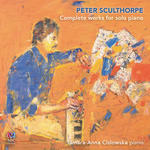 Sculthorpe is widely acknowledged as the first Australian composer to leave behind the traditions of Britain and Europe, and create a distinctively Australian music. His unique compositional voice was inspired by the land and the history of Australia, and by the cultures of our Pacific Basin neighbours. His solo piano music is prized for its rich elegance and beguiling simplicity, from the mesmerising beauty of Djilile, based on an Indigenous Arnhem Land melody, to the gentle nostalgia of Left Bank Waltz. This double-CD album begins with the exquisite Falling Leaves, written when Sculthorpe was just 16, and concludes with the vivid and ambitious Riverina, his most recent work for solo piano. With the tracklist compiled in collaboration with the composer, the recording includes every published piece as well as previously unpublished, unrecorded and even unperformed works. In addition to more famous pieces, there is a range of charming miniatures and a pair of works for prepared piano (Koto Music I and II), all of which confirm Sculthorpe's reputation as a composer of international repute whose music speaks to the heart of the Australian experience. Tamara Anna Cislowska, a close friend of Sculthorpe since performing his piano concerto with the Tasmanian Symphony Orchestra at the age of 14, was the composer's own choice for this recording. The album, recorded in June 2014, is engineered and produced by the ARIA Award-winning Virginia Read. Includes programme notes and biographical notes on composer and performer. 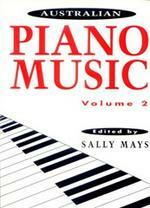 Score: Australian piano music : volume 2 / edited by Sally Mays. CD: Music of the new worlds / Byzantine-Mallon Duo.